I decided to get a few things done this year. knowing I should make them up. not long to finish it...a few hours really. I am using my phone camera and it looks real bad I know. I think I will make another real soon. Do you love hexagons too? Looks great! I love hexies, too. I've never tried them on the machine, tho'! Yes I love hexies and especially your quilt.. I am sure your girlfriend will love it.. I have hexie envy. This is on my want to do someday list. congrats on your finish! I do like hexagons and I like yours too. So will your friend. Your quilt is lovely Dawn. I'm sure Hilary is going to love it. So pretty! You did a fantastic job! Love your hexagon quilt - I've never thought of strip-piecing hexagons before! It looks beautiful, what a lucky friend you have. hello Dawn, I just arrived while blog hopping. I love your quilt. 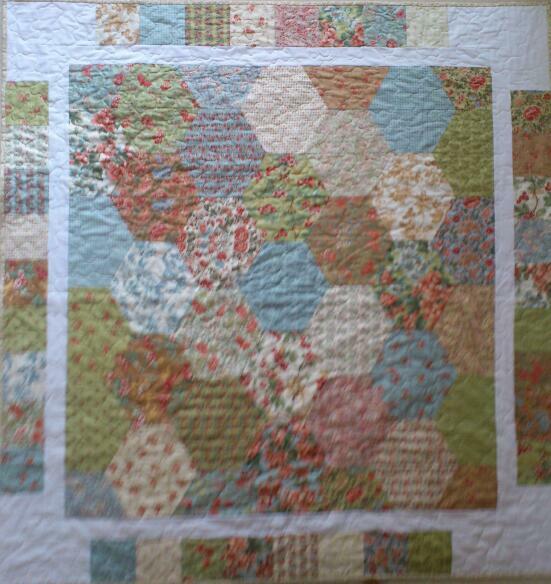 I like to hand sew (English paper piece) tiny hexagons. I particularly like how you made the borders. Nice to meet you!